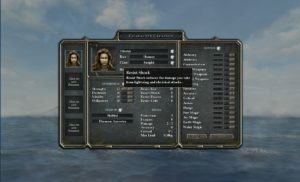 There’s something about character generation in an unfamiliar computer RPG. Even if you technically know how the rules work and you know how the options will affect things, you have no idea how they will play out in the adventure that lies before you. A powerful situational ability may never have its situation occur, or it may be constantly useful. To many, that’s a problem, and something to be avoided. Many modern CRPGs have eliminated this up-front character creation stage in favor of organic character development as the game progresses. That’s definitely a reasonable option (Frayed Knights does this too, but for a different reason), and for many players (especially those new to RPGs), a far less stressful version. I mean, who wants to spend the first hour of a game in some character creation screens?!?!?! Sheepishly, I raise my hand. Yeah, I do. Oh, not always. But yeah. I do geek out on this. In a lot of ways, it’s my glimpse into the game world and game system… the safe first foray. After all, except for a Traveller-based game, you can’t die in character creation! I’m a geek who likes playing with numbers, checking out options. Checking out the races and classes available. And, in a way, it’s kind of a teaser to set my expectations for what I might see in the game. Yes, we know, in most RPGs our initial encounters are with common pests (sometimes giant-sized) that won’t really demand our full abilities (our characters or our own), but character generation may give us a peek into what we can expect 8, 10, 12 hours from now as the game finally picks up. It gives us some anticipation. Energy Weapons? Daemons? Defense against psionic attacks? Let’s not forget the ability to customize the game to how you want to play it. Sure, you can do that with organic character development over time, too, but being able to pick out some special attributes right from the get go gives you an investment in your character(s) from the get-go. Anyway, I recognize that there are many players (most?) who really don’t care for this part of the game, and for them, a “quick-start” party or organic character creation may be just the thing. And there are some games (even my own…) for which that really is the better approach. But I’m glad to see some games – particularly indies – are keeping the tradition alive. I tend to be a fan of the “One character is you” method where you get to customize your own character fully. At that point, I prefer having to pick my team from a large (Potentially even random) cast of characters. But it’s funny you mention the Traveller system since I created my first character a month ago. A wicked agile thief. – Year 1, went to college, failed out. – Year 3, applied for Piloting Military, turned down and worked at a pirate for a year. Injured in gunfight with the law… DEX down. Fired as pirate. – Year 4 accepting into Merchant Piloting school… crashed ship nearly died, DEX down. Kicked from school. – Year 5, Worked as wandering nomad, got caught in gang war… made enemies and health max reduction! I stopped trying to create a character then. It seemed like just wandering the universe and fighting with no stats would be less dangerous. LOL. Yeah, the original Traveller system could be brutal. Character generation could really make you useless (and literally kill your character off before you start), and it really expected you to play a bunch of military retirees who have since gone merc… older, wiser, but maybe not peak health anymore. Probably not the most well-designed character creation system in history, but it wasn’t boring! 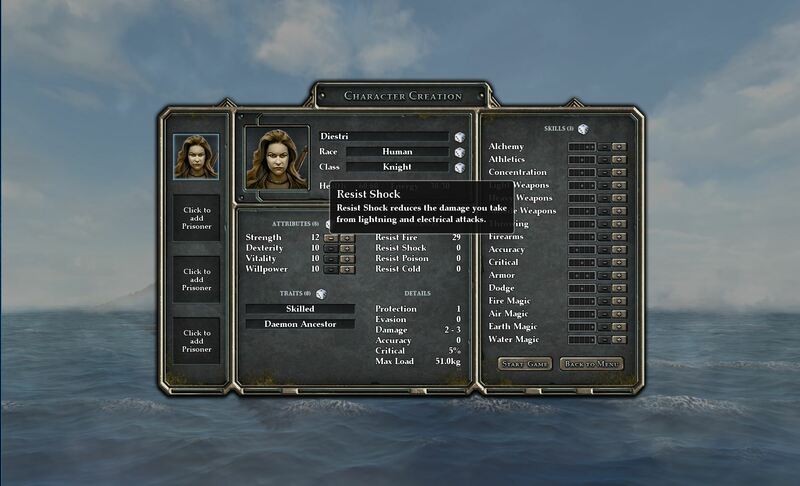 I remember spending a lot of time in the Exile III character creation (and training) menu. With tabletop RPGs, character creation is basically my favorite part. That’s probably why my homebrew has so many races and classes. And, I love customizing an entire platoon in a tactical cRPG. Yeah, and then you discover that that awesome specilisation in axes is useless ’cause you don’t find any magical axes worth their salts. Or, that improved psychic defense is not that useful because the psychic mechanic was scrapped from the game, but not from the character creation. Or you can buy rings of psychic immunity well before having to spend that point. Don’t get me wrong, I can and have spent hours creating characters. But nowadays, time-starved as I am, I want a game to give me pre-def characters AND, if I have the inclination, clean-sheet ones. Best of both worlds, then :p ! Yup, that’s happened to me more than once, too. A lot of the more modern games have gotten away from that kind of specificity, which is both good and bad. But if the game can’t support the Equestrian skill or make it anywhere near as balanced as a Beat Stuff Up skill, then yeah… it shouldn’t be there. One additional difficulty on the designer’s side is that so much may depend on the player’s playstyle. A skill that one player considers greatly overpowered to the point of being exploitable vs. another player who thinks its weak and almost useless, depending on how they play. You can’t even say, “Well, two opposite complaints, so I must have gotten it right,” because one playtester has probably become WAY more familiar with it than the other… but may not be as familiar with other aspects of the game.